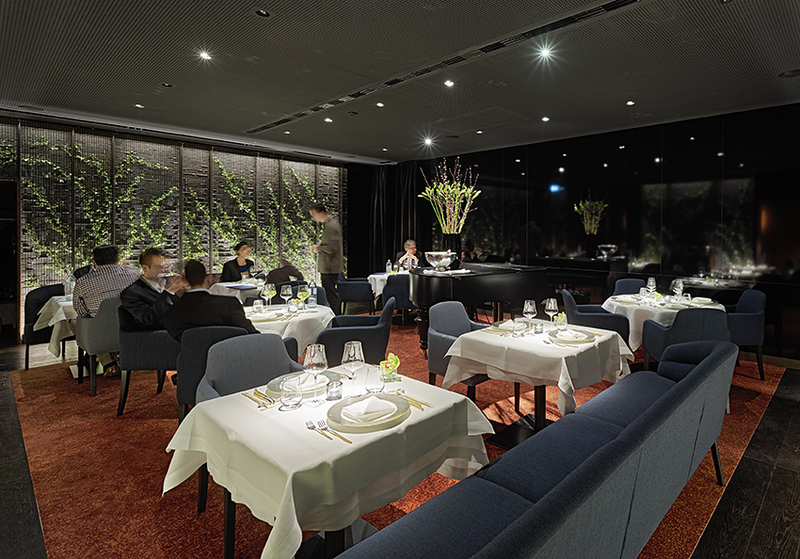 Over the past two years, Joji Hattori’s SHIKI in Vienna’s Krugerstrasse has made a name for itself not only for its contemporary interpretations of traditional Japanese haute cuisine, but also as a result of the restaurant’s pleasant ambience. The atmospheric but discreet interior has now also been acclaimed by the jury of the internationally renowned FINEST INTERIOR AWARD. At the beginning of the year, BEHF Corporate Architects in Vienna – the only Austrian prizewinner – was commended for its visionary concept. “We wanted to redefine Japanese gastronomy in Austria at SHIKI. BEHF’s subtle and elegant design language complemented this perfectly, and we are most pleased that the FINEST INTERIOR AWARD jury was also impressed by the extraordinary accomplishments of the designer,” says Joji Hattori, host of the SHIKI. BEHF Corporate Architects expressed the essence of the restaurant harmoniously and timelessly in the interior design. The inspiration for the concept came from exclusive restaurants in Tokyo with a fondness for European cuisine rather than from classical Japanese restaurants. The allusions to Japan are subtle. The colour scheme is delicate and allows the effect of different materials to take precedence. This allows the varied surfaces and thus also the visual appeal of every area of the restaurant to be experienced in numerous ways. The architecture and design of SHIKI thus also reflect its vision to be a place to encounter the meeting of two worlds. In the brasserie and bar area, the contemporary and comfortable urban atmosphere is created by a bright natural stone floor, finely woven copper on the walls, generously proportioned glass fronts, and a ceiling decorated with handmade and hand-painted Japanese paper. The reflective matt black piano-lacquer coated corridor takes guests past the Chef’s Table with a view of the kitchen, and then on to the fine dining area with two private booths. The lighting concept of lighting designer Philipp Metternich is particularly evident in the especially elegant atmosphere of this part of the SHIKI. Surprising spatial impressions created by reflections and light can also be found at the entrance, or in the spectacular passage down to the toilets, which is bright and elegantly furnished – as are the toilets themselves, which are also equipped with authentic Japanese toilet seats and state-of-the-art sanitary technology. The FINEST INTERIOR AWARD is presented to the finest European architects, interior architects, interior designers and decorators for outstanding achievements in the skilled and holistic development of new and revitalised properties. FINEST INTERIOR AWARD:contract honours projects from the commercial arena, while FINEST INTERIOR AWARD:private is presented to projects in the private sector. The FINEST INTERIOR AWARD:contract prizes are awarded in a total of 16 categories. In 2016, there were a total of 15 prizewinners from Germany, Austria, Switzerland, Poland and the Netherlands. BEHF’s SHIKI concept was the only Austrian winner of the internationally renowned award.